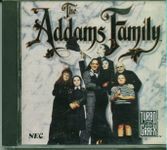 ICOM Simulations published The Addams Family video game for the TurboGrafx-CD in 1991. The player controls Tully Alford through several, side-scrolling stages on a quest to locate, and steal, the Addams Family vast wealth. Alford's main weapon is his umbrella, which can shoot fireballs, or he can transform into a wolf man. Source: Wikipedia, "The Addams Family (video game)," available under the CC-BY-SA License.